Blogging to run the world. Recently, I worked with Solution By Simulation to deliver election coverage results for the Trindad and Tobago Chaguanas West By-Election. This was a huge deal for me, having actually started election coverage tracking from the last Trinidad and Tobago Local Government elections in 2010. At that time, I was at one of the party headquarters – the PNM’s Balisier House. It was pretty near to my office. I sat with the media, and as results came in, used my app to publish the details to an RSS feed. This time, along with Nigel Henry’s team from SBS, we were gathering data from all three main parties, plus the EBC. Nigel, a pollster with experience in the 2008 Obama campaign, really knows his stuff. Whereas, I wrote an app to just collect results, he was geared to analyze and comment on what the results would actually be saying. Very cool stuff. On election night – July 29, 2013, we had agents in the field as well as Nigel in the commentators’ box and me in the studio room. Things went pretty smoothly, both for us and as can be seen, the party in green. Oh, the picture quality is pretty horrible because my phone’s camera is pretty lame. Also, at the last moment before our team went on the road, we got support from the local Microsoft Office in the form of Windows 8 and Window Phone 8 devices. Allowing us to say on air, “Communication Devices powered by Windows 8 & Windows Phone 8 Devices”, thanks, Microsoft! Here’s a really nice tweet that drove home what we aimed to do during the evening. The FP Group provides global insight and analysis. 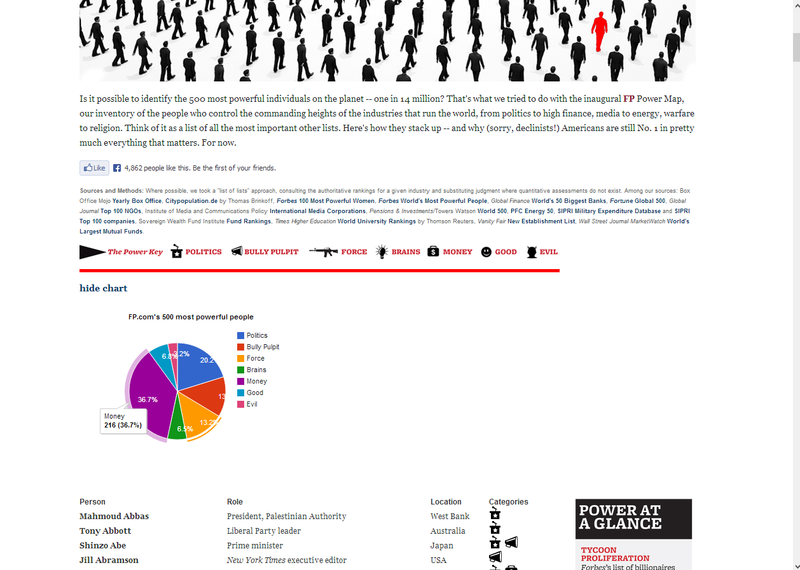 A friend had shared one of their articles with me, it listed, according to foreignpolicy.com, the 500 most powerful people on the planet. It was a pretty jive list, but it essentially was this table of 500 people. I felt for such a list, you should be able to sort, filter and even get some sense of aggregate information on the countries listed. So, I made a bookmarklet that would let me apply those features to the table they provided. As I wanted, you could now sort, filter or view a nice chart on the data presented. All right from within the page, thus not having to navigate away. Author irwiniumPosted on July 28, 2008 July 28, 2008 Categories UncategorizedLeave a comment on Hello world! Irwin Williams: Periodicals Blog at WordPress.com.